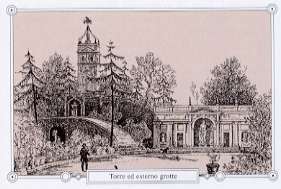 Conviene guardarsi bene dal passeggiare soli a Leintate; il giardino è pieno di getti d'acqua fatti apposta per inzuppare gli spettatori. 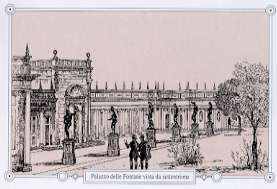 "I loved Lainate, a garden full of architectural elements, property of the Duke Litta… it is advisable to pay attention in walking around alone: the garden is full of water jets made to wet the visitors. Standing on the first step of a particular stair, six water jets wet me between my legs." 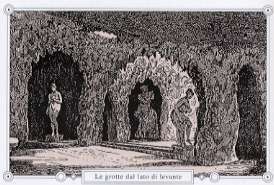 "Non meno di honorevolezza, che di comodità, e bellezza apportano le fontane, che si fanno per via di Loggie, e Portici, e Stanze, e Grotti Portici sotto, e sopra in terra in volto, e selicate de' Ciottoli, e rinvestite, de Tuffi, e altre materie impetrite in varie forme dalla Natura: e poi adornate quà e là di Nicchie con Statue di pietra, e talhor di metallo; le quali per via di spilli gettino, e spruzzino le acque, come si trovano in molte Vigne di Roma, e ne' Giardini e Palazzi di Genova, e del Conte Paolo Simonetta presso Milano, e del Conte Fabio Visconte a Lainate, e del Marchese Pompeo Litta, à Traincinese; ma tutti in piano...."
In this quotation the author describes the Villa in Lainate as a rich, comfortable, beautiful estate, with porticos, rooms and grottoes decorated with pebbles and covered with sandstone.There are niches with statues made of stone or metal that produce many water jets, as in other Villas in Italy. 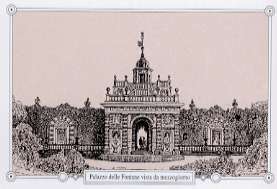 "Leinate col sontuoso, e a meraviglia vago palazzo del Conte Pirro Visconte Borromeo, con giardini, fontane, giuochi d'acque, e altre delitie non inferiori a qualsiasi altro luogo d'Italia, tanto più osservabile, quanto che in un paese privo d'acque naturali, con mirabile arteficio se ne cavano tante da un profondo pozzo, che servono à render il casamento istesso tutto dentro fontane. Non viene alcun Principe, ò Signor grande a Milano, che non vada, allettato dalla curiosità, à veder questo bellissimo luogo, e nissun di là parte senza restar soddisfatto, e ammirato insieme della splendidezza con la quale dal Conte (Pirro II Visconti Borromeo), o suoi Agenti viene trattato essendo sempre stato albergo de Principi, e gran Signori. Vi alloggiò la Regina di Spagna, il Cardinale Infante, i Duchi di Mantova, e altri Principi più volte, tutti regalmente accolti dalla generosità d'esso Conte Pirro". 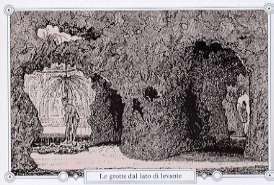 In this quotation the author underlines the beauty of the Palace of the Count Pirro I Visconti Borromeo; he describes the gardens with the fountains and the water games and many other astonishing things; the same as other places in Itlay, but much better because there is no natural river that permits the water games; the water is taken by a well. He tells us that in that time there was no Prince or nobleman that didn’t visit Lainate and wasn’t satisfied by the stunning setting and the unique water games. Some of the visitors of Lainate were The Queen of Spain, the Carinal Infante, the Dukes of Matova. In this quotation the author describes the palace as it was in 1800. He begins with the history of the Villa, designed by Francesco Brambilla. 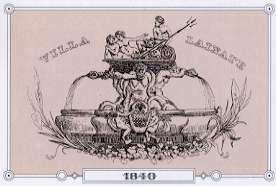 It was inherited by the Visconti Family and then by the Litta Family. At the time the author was writing in the Villa there was a painting of Daniele Crespi (The conversion of Saint Paul). Afterwards he focuses on the gardens, that were divided into four sections: in the first there were the greenhouses used to recover pineapples, in the middle of this section there was a fountain with eight statues and groups of little angels (he was describing Fountaine de Galatée). 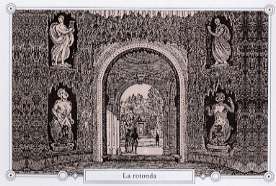 In the second section there is a small wood, from where you reach a grove that has in the middle another fountain decorated with tritons and Neptune. In the third section there is a fence and in there you can find a statue of Adone made by Marcantonio Prestinari. Always going through the wood you can reach the Water Palace; it has a rectangular shape, and it is splitted in half by a round space. The author says that the water comes out from everywhere. There are stuatues in bronze and marble, bas-reliefs, little angels and busts that decorate the two facades. Inside the rooms are covered by mosaics and there are also spaces decorated with sandstone that look like grottoes; this created particular light effects. Painter, who worked for many years in Italy. When he returned to Paris he became the first painter of Louis XIII. UNE LETTRE INEDITE DE L’ARTISTE FRANCAIS”, in "REVUE DE L’ART"
"Il sig.re Conte Fabio (Visconti Borromeo, primogenito di Pirro I Visconti Borromeo) mi a estato di maggior favore che nisono de gli Altri, mi fecce grati di mandarmi a Lina (Lainate) dintro una delle sue Carose donde io vide Al mio favore Artificio di Acque tuto quelo che si pol Veder le pitture di Camilo Porcacini più belle che in nisonno Altro loro di Millano et di più regalato di maniera che io restai confuso, vidi gli sui tre quadre di Corregio le quali sonno tanto belli che mi basto quella parola di bello non podendo dire di più". "The Count Fabio (Visconti Borromeo, first son of Pirro I Visconti Borromeo) did me the favor to send me on one of his carriages to Lainate where I saw the water games and the mosaics of Camillo Procaccini, more stunning that in any other place in Milan, and he gave me the possibility to be astonished by them, I even saw three paintings of Correggio for which I can only say they are beautiful, as there is no other word for them."